Reserve Bank of India (RBI) has released roll number wise / zone wise result / merit list of the written examination which was conducted on 04th February 2015 for all four zones i.e. 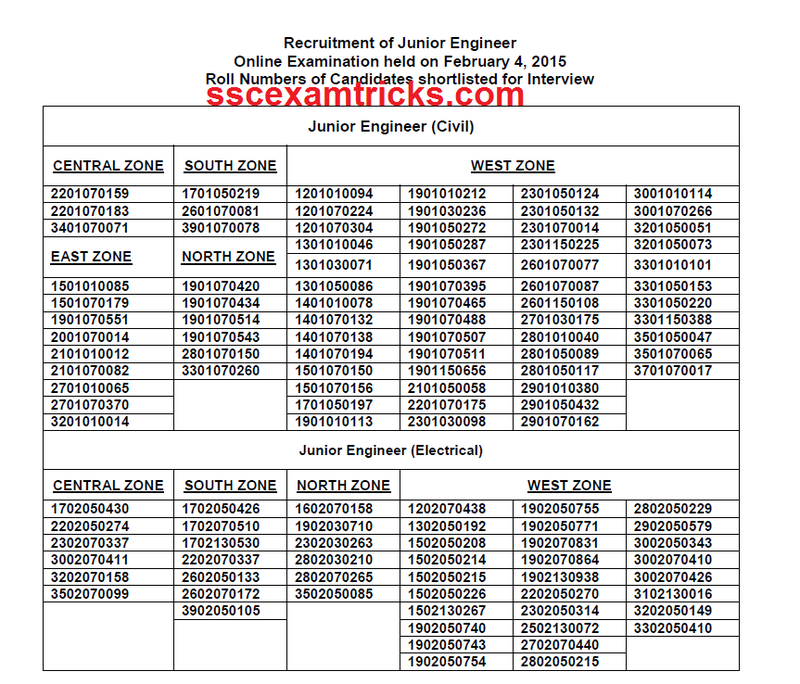 East Zone, West Zone, South Zone and North Zone against notification through advertisement no.1/JE/2014‐15 for 38 vacant posts of Junior Engineer in Civil and Electrical. A huge numbers of candidates had appeared in the written examination for these posts. RBI has released list of shortlisted candidates called for interview which will be conducted very soon. The interview dates will be released very shortly on the official website of RBI. Those candidates whose roll number is not mentioned in the list of shortlisted candidates are not qualified for next stage which is interview along with document verification of individual candidates. All the successful candidates are advised to send the following documents to the Regional Director, Human Resource Management Department at the addresses of the respective Regional Offices appended below by Courier/Speed Post so that it reaches them latest by 03rd March 2015. The latest news is that those candidates who had appeared in the written examination and waiting for their result can download their result/ merit list from the direct link provided in the end of the post. (i) 5 copies each of Attestation Form (all in original) and Bio-data filled in neatly by the candidates. (v) applicable proforma provided in Annex II to the advertisement. (vii) SC/ST candidates - Latest SC/ ST Caste Certificate in the prescribed format. The RBI JE Exam was conducted on 4th February 2015. The RBI JE EXAM 2015 was conducted by Pen MODE. In Pen Mode, No rough blank sheet was issued for calculations/rough work in exam. The Exam was available in bilingual languages- English & Hindi. The exam was conducted an objective multiple choice question paper of 150 questions of 200 marks to be done within 2 hours or 120 minutes. The exam was consisted of four sections contains questions of English (50 questions of 50 Marks), Engineering Subject Questions (50 Questions of 100 Marks) and General Awareness (50 questions of 50 marks). The exam was a multiple choice question paper in which four options were provided out of which candidates need to choose one correct answer. There was 1/4th negative marking for each wrong answer. The qualified candidates are called for 2nd stage which is interview stage. Three times more than required candidates are called for interview. Click here to download Detailed selection Process of RBI JE Exam 2015 in PDF.